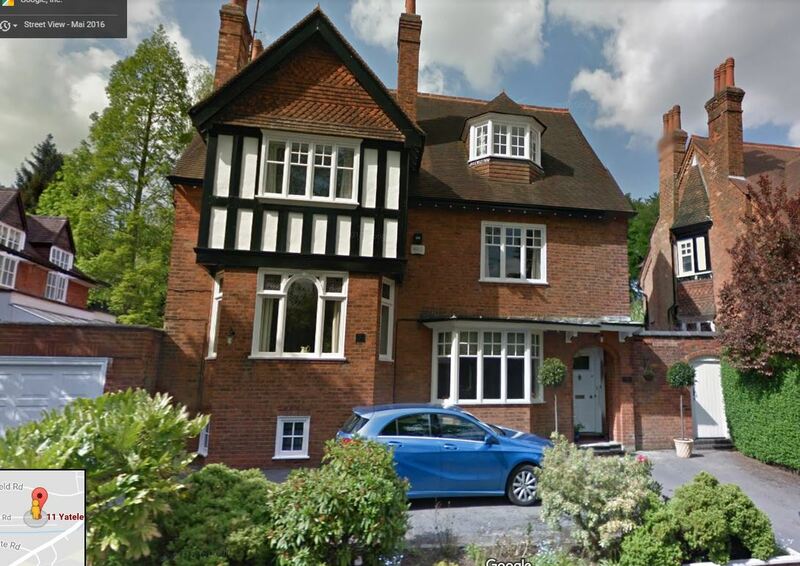 This entry was posted in England, Gau-Algesheim, Genealogy, Seligman/Seligmann and tagged Birmingham, England, Gau-Algesheim, Germany, hotel, Hotels, seligman, wine by Amy. Bookmark the permalink. Interesting enough- my former vetrinarian’s name was Schoenfeld. He lived in the Lansdale area and was the ex husband of a former friend of mine. He was Jewish and turned out to be gay- had two children Cara and a boy. He retired so have not seen him in years. Maybe a relative of yours? It’s a long shot—who knows? I haven’t really researched the Schoenfelds yet! What an interesting and outstanding man James Seligman was. I am reminded of those TV commercials ‘the most interesting man in the world’ for Dos Equis beer. James could no doubt today be the ‘most interesting man in the world’ for hotels and wine; take your pick. 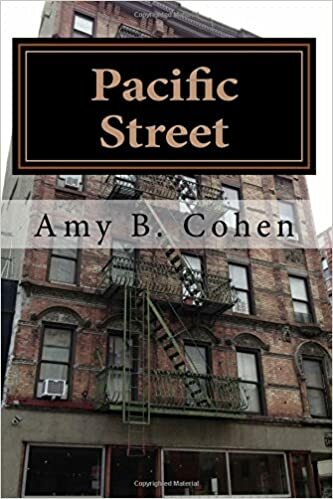 Great post Amy, I really enjoyed reading this. Thanks, Sharon! Yes, it would be fun to learn how he managed to become so successful. 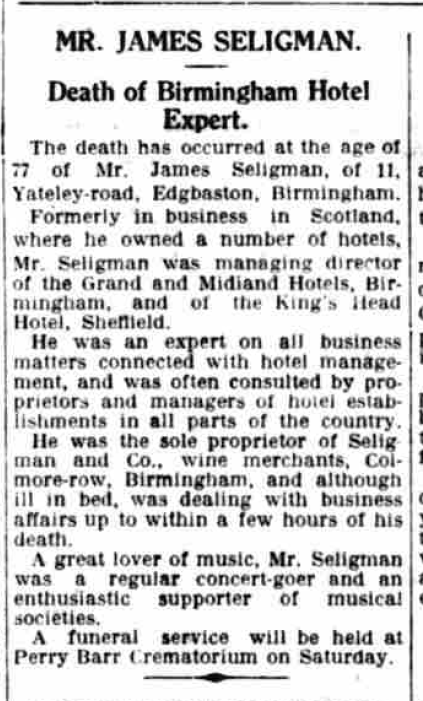 So enjoyed this post about James Seligman as Colmore Row is an area I visit often. It’s a small world Amy! 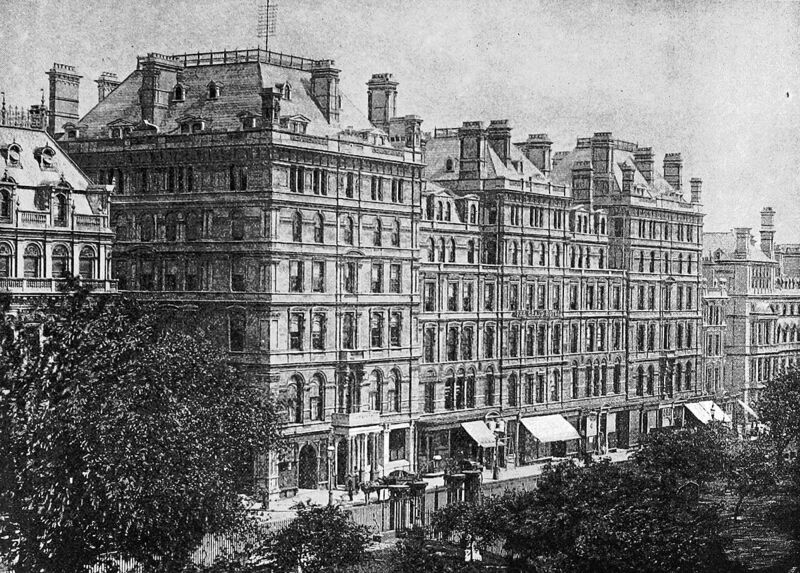 The Grand Hotel in Colmore Row held wonderful parties too as my mother used to attend. Is it still there, Shirley? I wonder if there is still a wine shop at that location also. How far are you from there? GRO? What’s that? And yes—45 years is a LOT. Two generations! Thank you for the explanation. I think I once knew what GRO meant as I once ordered several documents from them (and waited for what seems like an eternity). I am glad they’ve adopted a new procedure! You are welcome! Here’s hoping it moves from pilot program to permanent program. appear to make it look a bit bigger. Thanks so much, Shirley! How far are you from this area? I know exactly what you mean about the mess in your inbox. This week I unsubscribed to LOTS of emails that have been flooding my box. I think it’s wonderful that Wolfgang is sending you these items to round out your stories. The 45 years difference is unusual. I wonder what the biggest difference is in my families. I keep unsubscribing and sorting email (gmail lets you do that—you can force it into different categories in the Inbox), but nevertheless, things fall to the bottom and get neglected. Wolfgang is wonderful. One of the best connections I’ve made through my blog. We must toast James Seligman yes. The hotel’s structure is still there. I need to visit the area first and then get back to you. I agree with others the 45 years age difference between Clara and James was unusual. My brother married (briefly) a lady 30 years his junior and that was considered a biggish age gap. Given that people were often grandparents in their 40s back then, it really is quite bizarre to think of James marrying someone young enough to be his granddaughter! Wow! That really is a grand hotel. Does the Grand Hotel in Birmingham still exist (or the building)? How cool would it be to visit and stay the night? My friend and cousin Shirley says the building does exist and is being refurbished. We’ve already talked about meeting there and toasting James Seligman! I enjoyed this posting because it combines the local history of the business with the personal details of James’ life. Thanks, Emily. I love newspapers for that reason. Yes, me, too. I think the wine business has a story that would make a great novel with a few more elements added for interest. It probably does—wish I knew more about it! I hope you learn more. What a beautiful house and a very fine hotel!!! 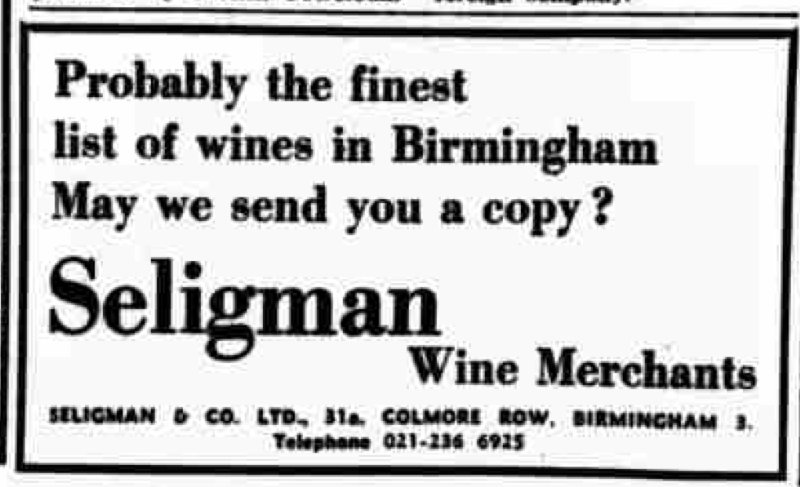 Interesting that James ran a vintner’s company in Birmingham around the time when the Cadbury family (famous Quakers, of course, and teetotallers) were so influential in the area. I do not go to Birmingham often (well, not for several years) but I recall it was one of the worst served cities for drinking establishments (pubs, and so on) anywhere in England – a legacy of the Cadburys. I wonder how James got along with them? I never knew any of this! Very interesting—thanks for the background. You bet! 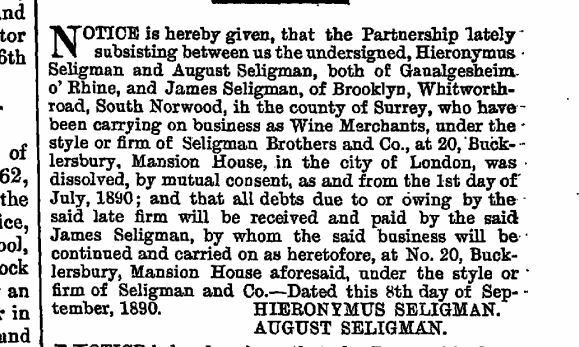 In the Seligman family there was at least one other man who married a much younger woman. Perhaps the Seligman men just had great longevity!